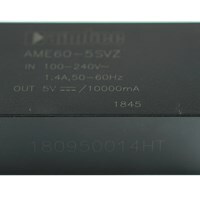 Montreal, Canada: Aimtec Launches its Most Affordable 60W AC/DC Converter! The new AME60-VZ is a brand-new AC/DC converter that offers much greater cost effectiveness due to material normalization and production automation also leading to improved reliability and performance. Due to these improvements, we are proud to offer you this converter at a price never yet seen for a 60W Aimtec AC/DC converter. Offering a commercial input voltage range of 85-264VAC and output voltages of 5, 12, 15, 24 & 48VDC, this series will greatly benefit your new system design. This new series offers operating temperatures from -40℃ to 70℃ with full power up to 55℃ depending on models. It also features a 4000VAC isolation for improved reliability and system safety. Furthermore, a higher MTBF of 300,000h, output short circuit protection (OSCP), output over-current protection (OCP) and an output over-voltage protection (OVP) come standard with the series. The AME60-VZ is suitable for street lighting controls, grid power, instrumentation, industrial controls and communication applications.